In many companies the patent department is seen as a cost center, managed by attorneys, and seen as a necessary evil by corporate executives. In truly innovative companies the patent function is seen as a profit center, and is imperative for the delivering maximum shareholder value for the organization. 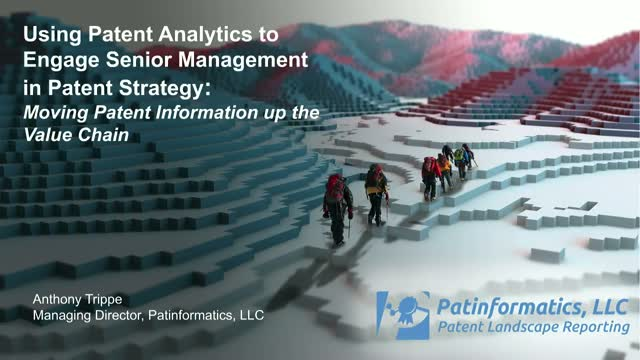 These companies use patent analytics to understand the technology environment they operate in, and make certain that they are taking maximum advantage of the investment they make in research and development and the patenting process. These organizations also have highly engaged corporate executives that are actively involved in the development of the company’s patent portfolio. Patent professionals in these organizations use the principles of diversification, and risk management, concepts that are well understood by senior management to bring these critical participants into the development of the company’s patent strategy. We will be joined by Anthony Trippe, Managing Director at Patinformatics, who was also recently named as one of the Top 300 IP Strategists by IAM Magazine. He will be sharing examples of how patent analytics can be used to understand technology environments, and competitors will be combined with a discussion on risk and diversification as a framework for building patent portfolios that enable corporate objectives and financial goals.